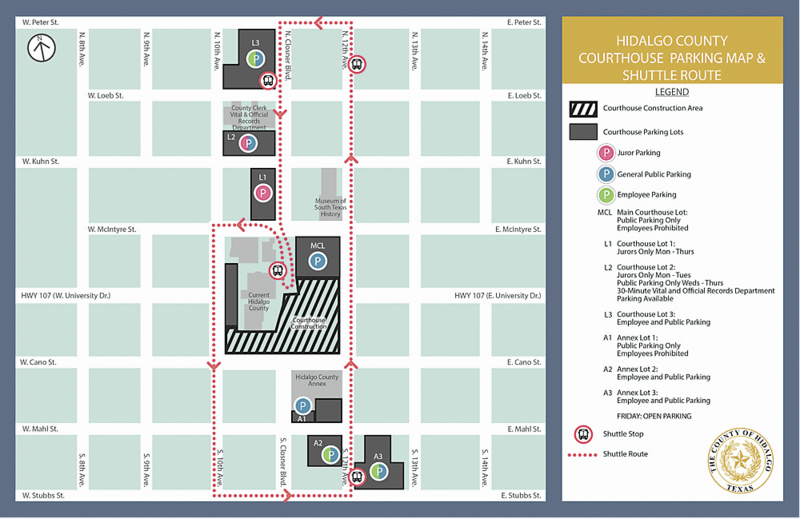 EDINBURG — Hidalgo County will implement a shuttle system to help courthouse visitors avoid a three-block trek in triple-digit heat when construction crews begin work on the new facility, which will result in the loss of about 300 prime parking spaces located in the courthouse square. 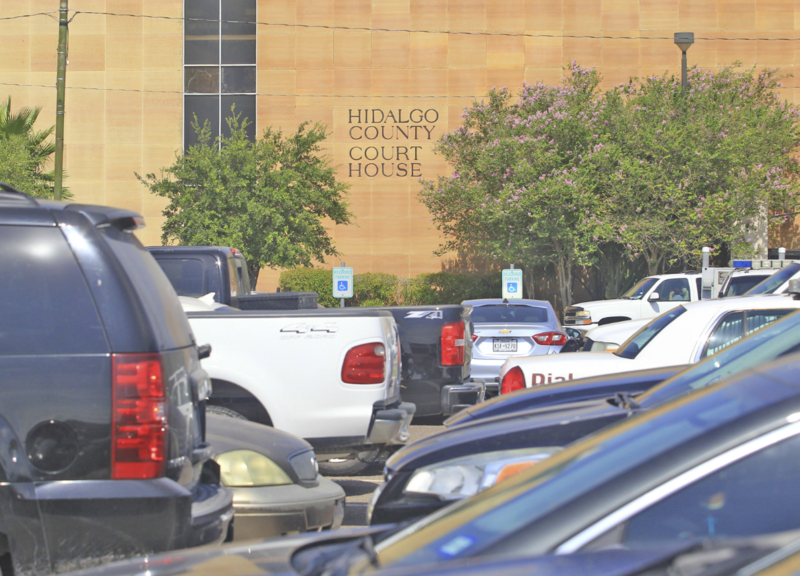 County leaders are confident Hidalgo County owns enough property near the courthouse to compensate for the parking spaces it will lose as a result of the placement of the new building and the permanent closure of a portion of Closner Boulevard. And parking is especially important as they prepare to break ground on the new facility Sept 4. Jonathan Almanza, the intra-governmental affairs director for Hidalgo County, presented the findings of a utilization study the county commissioned in February and a parking study provided by Jacobs Project Management in April to commissioners this week. “We realized that we needed to (find out) what our utilization was, whether or not county-owned properties could compensate for the loss of 300 parking spots, and to come up with a parking plan to meet the needs and for the convenience of the public,” Almanza said. The county used drones for a week in February to survey the parking lots in and around the area, gauging the parking situation at 8:30 a.m. and then again at 3:30 p.m. each day, Almanza said. “What the numbers showed was that at any given time — even our peak area — the surrounding lots had, at minimum, 300 parking spaces available,” he said, adding that the total number of combined spaces throughout the various lots was approximately 1,085. The studies also found that peak usage time landed on the first Tuesday of every month at about 8:30 a.m. The county owns about eight parking lots that range in distance, with the furthest one from the courthouse about three blocks away, Almanza said. So in order to solve that issue, he suggested the county prioritize parking. Visitors and the general public would be allowed to park in the courthouse square, while jurors would be directed to two of the nearest lots. Those two lots would be designated solely for jurors on Mondays and Tuesdays, the days in which the court typically summons them. “These will be secured lots by security for jurors-only access,” Almanza said. On any given Monday, about 200 jurors visit the courthouse in the morning, while another 200 visit in the afternoon, Almanza said. On Tuesdays, another 200 visit in the morning. The county is working on a partnership with Valley Metro to provide a two-shuttle system. The air-conditioned vehicles would make at least three stops along the route dedicated solely to the courthouse and the courthouse annex. “No one would wait at the bus stop for longer than five minutes,” Almanza said. A federal grant is going to cover 80 percent of the purchase price of the two trolleys and 50 percent of the yearly service and maintenance costs, he added. County leaders will also launch a public awareness campaign in both English and Spanish via radio, TV, newspaper and social media to help constituents navigate the area. Parking instructions and a map will also be included in juror summons beginning this month.